Have I mentioned purple is my favorite color? Like the deep plum color? This farro salad is not only delicious but also like really beautify. The caramelized red onions and bursting roasted grapes are perfectly nestled with creamy goat cheese and whole grains. I love hearty grain salads, especially this time of year. They make a great holiday meal contribution because they serve well at room temperature and can be made in advanced and transported easily. We hosted Thanksgiving this past week. I LOVE hosting, maybe a little too much. I tend to get carried away, never quite get everything I had planned done, but it somehow always comes together. My parents flew out from California and we had a handful of friends share the Thanksgiving meal with us. It was my 5th vegetarian thanksgiving to date, and my 10th thanksgiving with my husband! Our first thanksgiving, in 2008, was eaten on hot pink microwavable plastic plates in my dorm room. I'm pretty sure all we had was turkey, mashed potatoes, and jello but we felt soooo sophisticated with our red wine we weren't legally able to even drink. We've upgraded out thanksgiving-game significantly since then, and have spent each year following in a different place with different people. We try to make thanksgiving about gratitude and inclusion. I've started playing Christmas music about 30 seconds after we finished the meal on Thanksgiving day. Every year I think Christmas could not come at a better time. I tend to get the winter blues this time of year and the lights, christmas music, and holiday gift buying always seem to energize me from the inside out. In a medium saucepan bring the water and farro to a boil, reduce to a simmer, cover, and cook for about 25-30 minutes (though this will depend on the type of farro you use - see package for specific timing) until the water has been absorbed. Remove from heat, season with salt, and let cool. Meanwhile, preheat the oven to 425 degrees and line a sheet pan with parchment. Slice the red onion in half, then cut the onion in half moon slices about 1/2 inch thick. Scatter the onions on the sheet pan and top with fresh thyme springs then drizzle lightly with grapeseed oil, and a liberal dusting of salt and pepper. 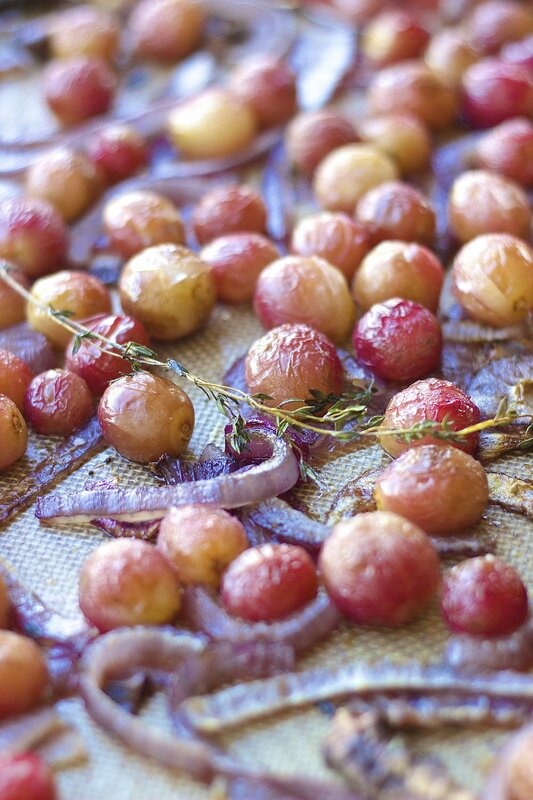 Cook for 15 minutes, then remove from the oven, toss, then top with the grapes and another light drizzle of oil. Return to the oven and cook for another 10-15 minutes until the onions are deeply caramelized. Remove from the oven and let cool slightly. Pour the red wine vinegar, olive oil, and chile flakes over the farro and toss. Top with pine nuts, goat cheese, baby kale, and onion and grape mixture. Toss well and enjoy!